The intuitive User Interface, contemporary Computer Graphics and substantially fast Solver Speed are some of the highlights of MIDAS/Gen. 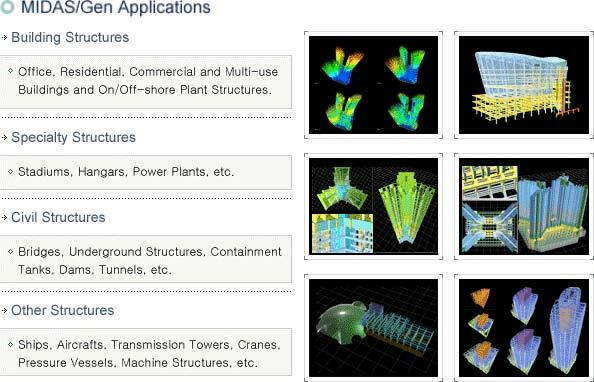 The user-oriented input/output features and significant analysis capabilities enable the practicing engineers and researchers to readily undertake structural analyses and designs for even complex and large structures. MIDAS/Gen offers conventional analysis capabilities as well as other analyses such as Geometric nonlinear analysis reflecting Large Displacement, Boundary nonlinear analysis, Pushover analysis, Construction simulated analysis reflecting time dependent material properties, Heat of hydration analysis, etc. Diverse ranges of specialty finite elements in conjunction with the latest theories of structural analyses render accurate and practical results. It is prominent for providing convenience, efficiency, versatility and productivity. MIDAS/Gen provides design capabilities using various standards of different countries reflecting conventional as well as unusual design conditions, leading to an Optimal Design.